On the inside, four pages of helpful tables and information for the GM, laid out in a landscape format that makes it easy to see over to the gaming table beyond. On the outside, four pages of glorious full-page Numenera artwork, with four alternate panels, identical to the others but sporting the Numenera logo. You decide where (or if) the logo appears on your GM screen by swapping these pages in for the equivalent artwork pages. You customize your screen by slipping your content into each panel, in any arrangement you like! Print them yourself, or have them professionally printed on heavy stock, with full bleeds (no white edges to the artwork), delivered right to your door. Free with the Purchase of a Deluxe Vinyl GM Screen! 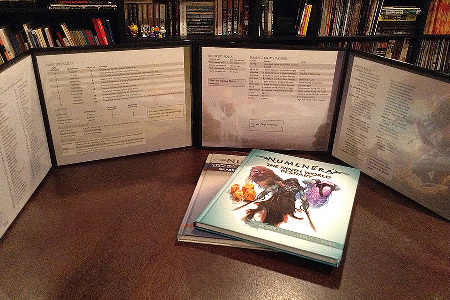 If you choose the print-on-demand option, you can have them delivered with a deluxe vinyl GM screen to hold all of the panels (you can even swap out the Numenera panels for The Strange GM Screen—or any other landscape-format GM screen content). 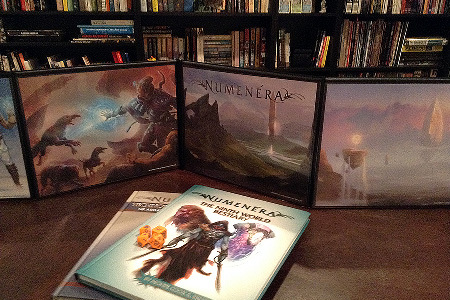 In fact, you only pay for the deluxe screen itself—you get the Numenera content for free! Customizable and reusable—as you change campaigns or game systems, just remove and replace the inserts! You can find more information on the Deluxe GM Screen here. To order The Strange GM Screen with the Deluxe Vinyl GM Screen, select the print-on-demand option. Then click the "Add to Cart with GM Screen" button that appears. Thank you so much for making these landscape orientation. I so strongly prefer this model. I wish more games would release GM screens this way.